What is the perfect way to express gratitude, really? A thank-you card, a bouquet of flowers, a gift card, chocolate? 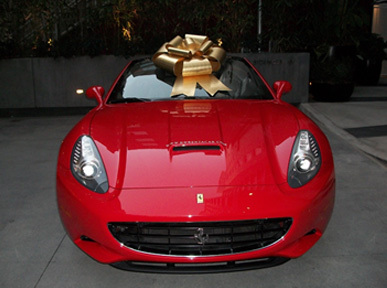 A picture frame, a poem, a nice watch, a Ferrari, your first-born? What do you do when nothing seems like enough? How many times can you thank someone without sounding like a broken record? Does this say “thank you”? How do I truly thank Dr. Charudatta Chaudhari, the man who has essentially saved my life? These are all questions I’ve been repeatedly asking myself for the past four months. There were obvious answers to some of these questions. Yes, yes, gift him all of the above, and then some! Except, well, my first-born–the man has enough responsibility already. Then, one day, it hit me: The Greatest Thank-You of All Time. Instead of giving him my first-born, I could just name it after him! It’s a long-lasting gift, and it gives him no extra responsibility. Perfect. AND it would put pressure on my child to achieve greatness–I’ll name you Charudatta Chaudhari, but the “Doctor” part is up to you, kiddo. So this decision had been made…and then Dr. Chaudhari just had to go and significantly improve my quality of life with the first surgery. The promise of it wasn’t enough–apparently this man believed in follow-through and was determined to make me better. What now? How do I repay the even bigger debt? Ah, yes! Name my second born after him as well! It’s not weird to name both of your children the same thing, right? Differentiating between them isn’t important, neither is their own identity–as long as they identify with the person after whom they’ve been named. Individuality is overrated, anyway. Well, little did I know, it soon wouldn’t be enough. I had a horrible lesion on my upper thigh that was well on its way to preventing me from being able to walk. It was the size of about half a ping-pong ball, and the swelling/inflammation surrounding it was the size of a pancake. The pain was so severe that it brought me to tears (if you know me, you know that I almost never cry from pain). I went into his office that day for a dressing change, and he decided he needed to do something about that lesion. He stuck a needle in it and drained it (5 cc’s of liquid, before continuing to drain on its own for the next 3-4 days). The relief was immediate and overwhelming. Every other doctor I’ve seen would have sliced me open and created more problems/pain, but Dr. Chaudhari went the virtually painless (but SO much more effective) route. I was left without words. Anyway, that day, I decided that my future husband would have to change his name to Charudatta Chaudhari. It’s just one of my requirements. If you love me, you’ll oblige, right? Your name cannot possibly mean more to you than it does to me. What, you were named after your great, great, great-grandfather who risked his life and established the family name with his successful leather goods shop? Well, I’m trying to thank someone. Stop being so selfish. Sigh…and then the second surgery happened. And after a long recovery, I started to feel like my own person again. I could finally get out of bed without assistance, I was able to dress myself, and I took my first independent shower in over half a year. What, now? How can I thank the person who has returned to me my lost independence? I’m going to change my name to Charudatta Chaudhari. Dr. Chaudhari, for my sake, please don’t perform any more miracles on me. I’ve run out of people to name after you. This entry was posted in Humor and tagged charudatta chaudhari, future children, gifts, humor, thanks. Bookmark the permalink. it was hilarious and at the same time humbling to read your post. There is no joy bigger than the one you feel when you know your advice has worked for someone. But remember that the world is like a mirror, and it reflects what you feel, and will give you what you desire. People present at that time are just witnesses. They are neither the cause nor the result of the effects. Only the emotions are true. wow you are such a funny writer. so much spirit and tone in your writing, i feel as though you’re just casually conversing with me 😀 you’re so awesome!!! Thank you, Jess! I was hoping to convey that kind of tone, so it’s good to know that I was successful : ) you are such a positive reader!